Busy tourist bees are on a sightseeing tour in New York City. First stop was Little Italy on May 31st. They left rather disappointed and some could be overheard complaining that there was very little Italian authenticity left in Little Italy. On June 13th they visited Chinatown, again they left in a whim, this time complaining that smaller stores like Industrial Plastics had been replaced by corporate behemoths like Bank of America. They were not at all pleased, may I tell you, not at all! The leader of the gang 'Ice-B' pronounced that there next visit would be Mr. Bloomberg's office at Gracie Mansion. When Ice-B was told he would take a huge risk to enter NYC for a 3rd time, he said that he would seek an end to bee-term-limits within the Borough of Manhattan, with total disregard of the laws and regulations set by his constituents. 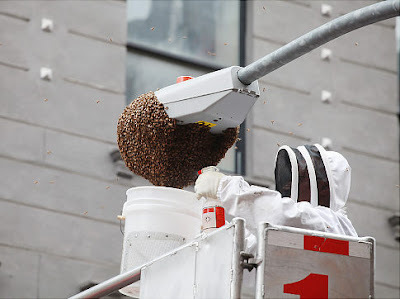 Some 15,000 bees cover a light fixture on Mott Street in Chinatown on June 13th 2011 (Jefferson Siegel for News). A Chinatown street was abuzz Monday with news of a strange sort - thousands of bees descended on a block and forced the NYPD to divert traffic. The swarm of some 15,000 bees was finally captured by an NYPD beekeeper around 5 p.m. after it perched on a streetlight. The incident took place on Mott St. between Bayard and Pell streets. It is the latest in a spate of bee swarms to visit the city. 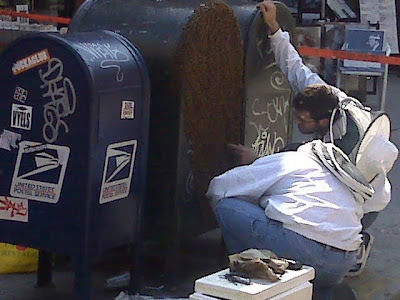 Two weeks ago, some bees swarmed a mailbox on Grand Street in Little Italy, DNAinfo reports. And a few days later, another swarm buzzed around a fire escape in Washington Heights. Invasion of the Killer Bees. This could only happen in New York. The bees are having a difficult time, but you wouldn't know this if you were in Little Italy today. A giant swarm of bees inundated a mail box on a Little Italy street corner Tuesday, closing down the sidewalk for hours and drawing dozens of curious onlookers. Hundreds of bees attached themselves to the side of a mailbox at the corner of Mulberry and Grand Streets around noon Tuesday, forcing the NYPD to close off a portion of the sidewalk and post officers to keep an eye on things until the bees could be safely removed. "It's like a movie scene. It's pretty cool, I kind of wish there were more," said Mike Costabile, 25, who works nearby and was out getting coffee. "I want to see all these people standing out here and the queen move again." The box, which was located directly in front of the Italian-American Museum at 155 Mulberry Street was hard to make out under the blanket of bees covering almost one entire side. The museum was closed at the time. It did not appear that anyone had been hurt by the swarm. Elie Miodownik, of the New York City Beekeepers Association, showed up in full beekeeping regalia ready to scoop the bees up and bring them home, where he said he has a queen bee and a hive waiting. Miodownik said the bees swarmed to the postal box around noon, and that swarming bees are a common phenomemon this time of year. The bees were still in place around 3 p.m. Tuesday while officials waited for a city beekeeper to arrive, said those on the scene. "It's a swarm, a natural phenomenon when a beehive gets overcrowded," Miodownik explained, "It tends to happen more in the spring or summertime. It means that there's a beehive within a couple blocks." Miodownik suspected that the cluster of bees covering the postal box were attending a queen bee, who usually starts the swarm by flying out of the crowded nest and prompting half of her worker bees to follow behind her. An NYPD beekeeper showed up at the scene around 3:30 p.m. and began inspecting the bees on the side of the post box with Miodownik's help, in search of the queen, they said. The sidewalk was still closed off as of 4 p.m. Tuesday.